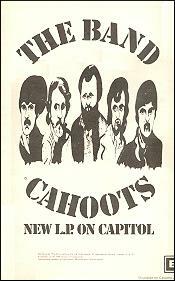 Cahoots was the first album recorded at Albert Grossman's Bearsville Studios in Woodstock. The sessions were difficult, as the studio was still having the bugs worked out and the Band was experiencing internal problems. Robertson's songs had become much more difficult; the structures, chord changes, and arrangements were increasingly complex. 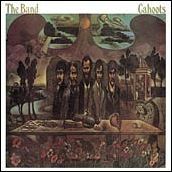 Despite these factors, the album has a number of gems, including "Life Is a Carnival" with its great Allen Toussaint horn arrangement, Dylan's "When I Paint My Masterpiece," a duet between Richard Manuel and Van Morrison entitled "4% Pantomime," "The River Hymn," and "Where Do We Go from Here." 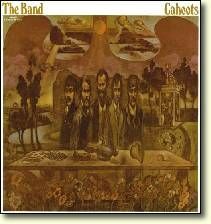 See also Jill Howland's review from the Usenet newsgroup alt.music.the-band and Peter Viney's Cahoots article from the Band fanzine Jawbone. 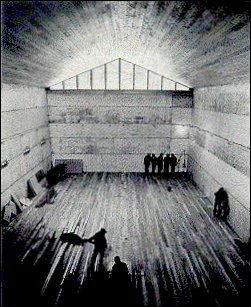 Outtake, recorded 2/8/71 at the Bearsville Barn. 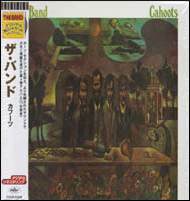 This version features Manuel singing the lead instead of Danko. Alternate take (take 10) - this earlier take was mixed but unused. 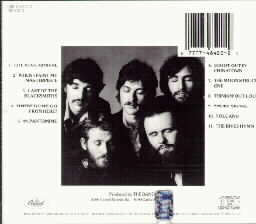 Recorded at Bearsville Studios, it is missing overdubs that are found in the final master, which used take 17, not take 10, as its foundation, according to EMI. A version of this song was initially included on Dylan's The Basement Tapes, but Robertson told the reissue producers he believed this was cut in between albums and fit in best with Cahoots. Same situation as "Bessie Smith." This Marvin Gaye cover was an in-concert favorite (it was the final track at the The Last Waltz,) but the version included here is taken from an acetate, cleaned up from the version that has circulated among bootleg collectors. 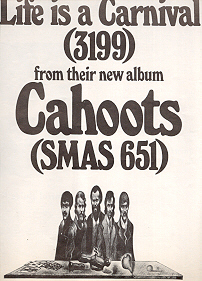 60-second radio spot produced to promote Cahoots.